Cat lovers everywhere will recognize this "You must be kidding!" cattitude. A spotty cat watches with a mix of curiosity and concern as three companionable mice come a little too close for comfort. Finished size is 13in x 15in. 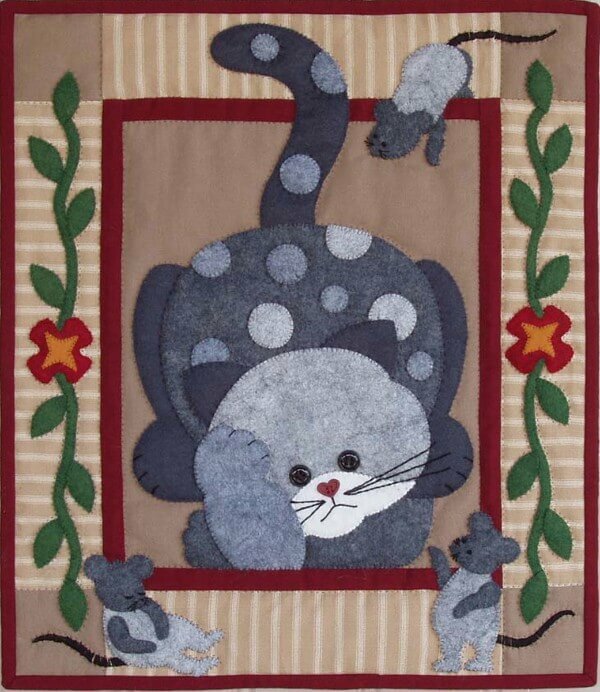 Kit includes all woolfelt for applique shapes, all fabrics (100% cotton) for background, borders, back, and binding, batting, buttons for eyes and nose, embroidery floss, precise patterns and complete instructions. Colors are shades of gray, wine red, wheat and green with gold and white accents.